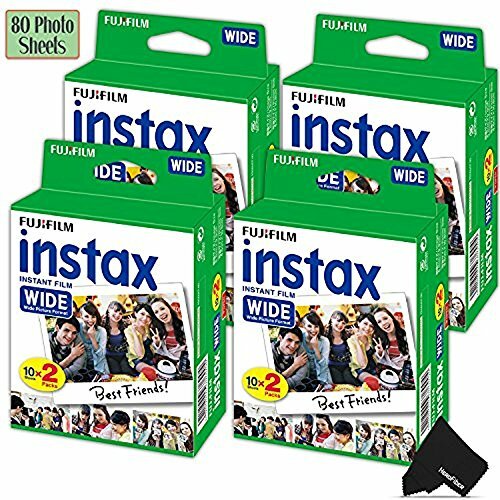 Included in This Film Kit is the FujiFilm Instax Wide Instant Film 4 Pack (4 x 20) for a total of 80 Photo Sheets. FujiFilm Wide Instant Photo Compatibility > The FujiFilm Instax Wide Instant Film are compatible with all FujiFilm Instax Wide Cameras including FujiFilm Instax FujiFilm Instax Wide 300, Instax Wide 210 and Instax Wide 200. in addition they are are made of high quality material to ensure a vivid natural color for a gorgeous Wide Photo. Included in this FujiFilm Instax Wide Film Kit is a HerFiber ultra gentle cloth designed to clean your camera lens and other sensitive electronics and accessories.